Lochiel Park is arguably Australia's most environmentally sustainable residential estate. Started from a vision to create the nation's model green village, Lochiel Park has been a showcase of environmentally sustainable technologies and practices. Since the estate's inception, the University of South Australia has been involved in shaping the environmental targets, monitoring performance, and undertaking an extensive research program. This multidisciplinarly living laboratory, located in suburban Adelaide, has helped create a detailed understanding of low carbon homes and their impact, informing sustainable housing decisions throughout the world. Conducting Lochiel Park research has involved a varriety of partnerships. The University of South Australia acknowledges the important role these partners have played, including: the State Government of South Australia's land development agency, Renewal SA, for their ongoing, continuing partnership as stewards of this residential estate; the Cooperative Research Centre for Low Carbon Living recognising Lochiel Park as a national living laboratory; CSIRO and their involvement in national research projects; and, most importantly, the residents of Lochiel Park for their continued participation, allowing the research to happen! Do zero energy homes stay zero energy? From the evidence available the Government as investor would expect to achieve multiple policy outcomes across areas as diverse as health and wellbeing, productivity, energy, as well as the public budget. From a macro-economic perspective, although many impacts were not able to be monetised with sufficient confidence, the Government investor will experience a net increase in local employment, downward pressure on energy prices, and increased economic activity within a more efficient economy better able to respond to world energy price increases. This report concludes that the value proposition of low carbon living is overwhelmingly positive to the South Australian Government with a conservative NPV of $1.31 billion for a 10 year policy action, and a benefit/cost ratio of 2.42. The empirical evidence demonstrates that low carbon living will provide many benefits including improved energy efficiency, energy network infrastructure savings, improved human health and wellbeing, carbon emission reductions, and benefits from increased social capital. The benefits far outweigh the costs associated with creating low carbon housing. The report highlights the importance of industry learning. As the housing industry adopts new technologies and practices, increases low carbon building system production volumes, improves industrial processes, and develops skills and knowledge across the various building industry professions, the net economic benefits to the community increase. Given the limitations of the data, the value proposition for low carbon living from the perspective of Government is overwhelmingly positive in Australia’s most populous warm temperate climate zone. Whilst net zero energy homes are espoused in many policy circles, and many bespoke examples have been constructed to demonstrate their technical feasibility, there is a scarcity of evidence demonstrating such a standard would be economically rational, particularly for large scale housing development where orientation and aspect may not always be optimal. Drawing on energy monitoring evidence and construction economics associated with the Lochiel Park Green Village in Adelaide, Australia, this paper explores the economic feasibility of the net zero energy home policy in warm temperate climates. The results demonstrate that using economic tools and assumptions typically applied for building energy regulatory policy changes, net societal economic benefits significantly outweigh costs. This report concludes that the value proposition of low carbon living is overwhelmingly positive to owner occupier households with a conservative NPV of $24,935 if the home was built in Year 1 of a policy change to net zero energy housing, and with larger net benefits received for homes constructed in subsequent years. The clear economic outcomes, combined with expected health and productivity benefits from improved levels of thermal comfort, should provide security to policy makers to progress home energy standards towards net zero energy performance. Many countries are searching for ways to reduce the energy and carbon impact of housing. The terms net zero-energy home and net zero-carbon home have entered the policy lexicon, without clear definitions and without widespread understanding of the likely policy impact. Is the concept limited to bespoke architect driven buildings for specific green clients, or does it have relevance in the mainstream house building sector and typical households? When we consider volume house building and contemporary lifestyles, what is the energy end-use reality of so called zero-energy homes? Can government policy instruments deliver housing estates that are thermally comfortable, energy efficient and powered by renewable energy? The Lochiel Park Green Village in South Australia represents a genuine attempt through government policy processes to create a suburb of (nearly) zero-energy homes in a near zero-carbon estate. The development includes 103 highly energy efficient homes of various sizes, all utilising solar thermal and solar photovoltaic sources, and built to stringent environmental urban design guidelines. The energy used and generated at each house is being monitored and analysed to extend our understanding of what happens when families bring their energy habits to near zero-energy homes. Appliance and equipment audits are conducted to extend our knowledge of the energy services utilised in contemporary digital-age lifestyles. This paper provides an insight into the quanta of energy using appliances and equipment that fill our homes and satisfy our ever-growing needs. The paper presents key results from two years of monitoring for the initial tranche of houses, demonstrating that although significant reductions in operating energy use has been achieved, few households have reached a net zero energy standard. The research highlights the extent to which our choice of energy systems and our individual behaviour affect the total annual energy use. The energy end-use and energy generation results are examined to identify the contribution of near zero-energy homes to the twin policy challenges of anthropogenic climate change and peak power demand. Using empirical evidence from extensive monitoring, this paper throws new light on the energy use of actual families in contemporary near zero-energy homes. The transition to near zero energy and near zero carbon homes places the policy focus firmly on the widespread application of renewable energy technologies by the mainstream building industry. This systemic change from typical business practices for house design and construction to embrace the application of photovoltaic technology is likely to come with significant risk to policy outcomes. Using evidence drawn from the Lochiel Park housing estate in Australia, the use of prescriptive building energy regulations to facilitate the application of photovoltaics may not deliver the expected policy outcome, and better policy outcomes are likely from applying a performance based standard. Lessons learnt from Australia point to issues related to regulatory design, industry training, and compliance assessment. Addressing these issues will be essential to achieve low carbon policy intentions. With policy directions firmly moving towards net zero energy homes, what do we know about the perceptions and experiences of households who already live in homes at or near that standard? The research sets out to determine whether householders believe these buildings are thermally comfortable, and if they feel confident operating the smart technologies that help achieve the net zero energy outcome? Combining interviews from 25 households and monitored energy data from over 50 near zero energy homes, this paper examines the validity of this policy goal from the building user perspective. The evidence shows households within the Lochiel Park Green Village attain relatively high levels of thermal comfort, enjoy lower energy bills, and believe their behaviour has been influenced by the building and its energy systems. Yet many remain concerned that the building industry is unable to produce homes that maintain thermal comfort in all spaces and all seasons, particularly the level of thermal comfort in upstairs rooms during summer. The residents have also identified significant issues in the reliability and usability of some energy technologies, with the majority of concern focussed on the performance of solar water heaters. Whilst the policy of near net zero energy homes appears valid from the end-user perspective, the case study highlights the substantial task ahead for policy makers to establish suitable commissioning and compliance processes, and develop effective energy rating tools to support the path to zero energy homes. Net zero and near zero energy buildings are firmly on the agenda as a key policy action to reduce anthropogenic greenhouse gas emissions. But what is the reality of energy use in so called zero energy homes? Does the combination of energy efficient appliances, thermally efficient building shells and renewable energy technologies result in significantly lower energy use? Using empirical evidence from the extensive monitoring of an estate of (nearly) zero energy homes at Lochiel Park, this paper examines the longitudinal energy use from a sample of buildings to explore whether homes maintain their intended performance level over time. Disaggregated to major energy end-uses (heating and cooling, lighting, refrigeration) and solar electricity generation, this paper examines the continuous operation of near zero energy homes over a period of four years to identify any evidence of energy use rebound, asking the research question - do near zero energy homes maintain their performance over time. The results show that with the exception of lighting energy end-use, there is no measurable significant change in performance or pattern of change across the four years of monitoring. Fixed indoor lighting energy use shows a relatively small but consistent annual increase for each of the monitored years. Overall, for the medium term period of 4 years, nearly net zero energy homes maintain their improved levels of energy performance. In the context of reducing household greenhouse gas emissions, in-home energy feedback displays have been trialled as a mechanism to assist households to monitor and change energy-use behaviour. As we move towards technology-rich zero energy homes the challenge of managing energy use and electricity generation systems will increase and a new role for in-home feedback displays may emerge. This paper describes the in-home display and monitoring systems installed in the Lochiel Park residential estate and provides a summary of the energy use data generated by the systems. It also draws on 25 in-depth interviews to discuss the residents’ attitudes towards, and experiences interacting with, the in-home feedback display and energy management system. Residents describe how the feedback display has been used to assist them to understand their end-use energy behaviour, reduce net energy use, and assess whether household appliances and renewable energy systems are operating correctly. The role of energy system fault identification is highlighted by many interviewees, whereby the feedback displays provide the means to monitor system performance, identify system failures, and maintain low energy-use outcomes. The development of a framework for defining net zero energy and net zero carbon homes has seen significant progress over the past decade. With anthropogenic climate change the principal driver, numerous governments are moving to regulate homes at or near a net zero energy or net zero carbon performance level. For example, the South Australian Government established design guidelines for the Lochiel Park Green Village to approximate a net zero energy standard. What has been missing in the literature is a discussion of how the basic principles of performance-based building regulation will shape the definition. The very nature of performance-based regulation as a legally contestable instrument shapes and limits the content of a regulatory definition. This paper examines the recent literature on zero energy and zero carbon building definition frameworks, explores the key characteristics of performance-based standards, and determines practical definitions that could be adopted within performance-based building codes. Energy use in residential buildings is a significant contributor to global carbon emissions. The South Australian Government responded to concern for anthropogenic greenhouse gas emissions by creating a model development of near zero energy homes in a near zero carbon impact estate. The creation of the Lochiel Park Green Village challenged a collective of industry experts and policy makers to set objectives, performance targets and regulatory guidelines outside existing institutional and professional norms. Literature suggests that the creation of niche events can help the transition away from dominant technologies, practices and beliefs, and lead to organisations embracing new tools, construction practices, technologies, standards and policies. By applying a multi-level socio-technical framework, and utilising evidence collected from a series of interviews with key government and industry leaders, this paper examines how, under the influence of landscape pressures, structural change at the regime level can come from the incubation of ideas and experiences at the niche level. The available evidence finds that the creation of the Lochiel Park Green Village has allowed many individuals and organisations to gain a more detailed and practical understanding of sustainable housing, and has given organisations the confidence to change industry practices, government policies, and regulatory standards. With the expansion of domestic rooftop solar photovoltaic (PV) systems throughout Australia and their potential increasing impact on the energy market, household energy bills and the electricity grid, there has been little evidence on how installed PV systems actually perform. This paper compares the theoretical and actual monitored gross solar generation for a cluster of low-energy houses within the Lochiel Park Green Village in South Australia. Comprehensive monitoring of energy generation of five grid connected dwellings for a continuous period of 12 months is presented. The minimum solar system capacity required is 1kWp per 100m2 habitable floor area. The data collected from these systems is compared with theoretical mathematical predictions based on solar system information such as inclination and azimuth angles of the installed panels, the peak power rating and efficiency of the panels and the inverter, and 1-minute solar irradiation data. 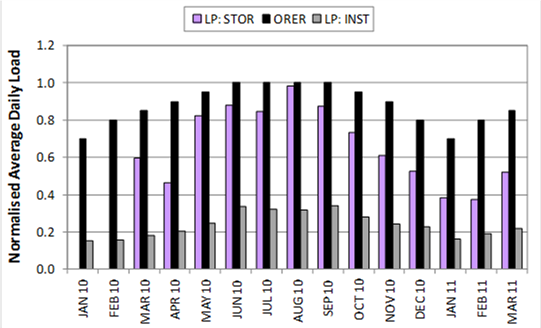 Graphs: (left) Histogram comparing the monitored solar power generation of L30OO before and after fault rectified; and (right) Comparison of monthly gross solar energy before and after a fault was rectified. The research has found that the monitoring systems are valuable tools for determining whether a PV system is operating at all or at the expected level, and can be used to identify issues caused by shading, disconnected panels or inverter problems. In addition, the paper provides examples of how the installed monitoring systems have been used to identify solar system installation issues and major faults. Finally, the paper discusses observations on inverter failures, and installation trends regarding panel and inverter specifications. Whaley D., Pudney P., Grantham A., Saman W. (2014) 'Performance of a cluster of low-energy housing rooftop PV systems: Theoretical vs. Actual output', Solar 2014, Australian Solar Energy Society. This report presents the findings of multidisciplinary research which develops a national framework to evaluate the potential impacts of heat waves. It presents a technical, social and economic approach to adapt Australian residential buildings to ameliorate the impact of heat waves in the community and reduce the risk of its adverse outcomes. Through the development of a methodology for estimating the impact of global warming on key weather parameters in 2030 and 2050, it is possible to re-evaluate the size and anticipated energy consumption of air conditioners in future years for various climate zones in Australia. Over the coming decades it is likely that mainland Australia will require more cooling than heating. While in some parts the total electricity usage for heating and cooling may remain unchanged, there is an overall significant increase in peak electricity demand, likely to further drive electricity prices. Using a number of social research instruments, it is evident that households are willing to change behaviour rather than to spend money. Those on lower income and elderly individuals are the least able to afford the use of air conditioning and should be a priority for interventions and assistance. Increasing community awareness of cost effective strategies to manage comfort and health during heat waves is a high priority recommended action. Saman W., Boland J., Pullen S., Pocock B., Belusko M., Bruno F., Whaley D., Pockett J., Bennetts H., Ridley B., Palmer J., Zuo J., Ma T., Chileshe N., Skinner N., Chapman J., Vujinovic N., Walsh M., Miller W., de Dear R., Candido C., Deuble M., Soebarto V. (2013) ‘A framework for adaptation of Australian households to heat waves’, National Climate Change Adaptation Research Facility, Gold Coast. Lighting technologies have witnessed remarkable improvements in energy efficiency over the past few decades with the developments in compact fluorescent and light emitting diode technologies. But has the application of energy efficient lighting delivered a lower energy use outcome? This paper compares the domestic lighting energy use of a number of comprehensively monitored houses within two Australian housing developments constructed a decade apart. The Mawson Lakes estate was built in the early 2000’s, whilst the Lochiel Park estate was designed to be nearly zero energy and was constructed in 2009-2015. Whilst the lighting technology applied at Mawson Lakes was more typical of standard construction practice at that time, strict urban design guidelines and encumbrances were sanctioned in Lochiel Park to reduce the energy used for lighting as well as other major energy services including thermal comfort and water heating. The application of energy efficient lighting technologies at Lochiel Park has resulted in significant energy savings. Analysis of the monitored house energy data within each estate shows that the near zero energy houses use, on average, 40% less energy for lighting than those in the nearby Mawson Lakes estate. In addition, there was a reduction of average peak power drawn by the low energy housing lighting circuits of 61%. This is despite the wiring convention used in Australia which combines the ceiling and wall-mounted light fittings together with other devices such as ceiling fans and bathroom exhaust fans and heat lamps which are more prevalent at Lochiel Park. The case studies indicate that the application of energy efficient lighting technologies, in the context of contemporary lifestyles, reduces both energy end-use and peak energy loads. The aggregated results for some 30 Lochiel Park households provide reliable data on the overall impact of low energy housing generating solar power on the electrical grid. 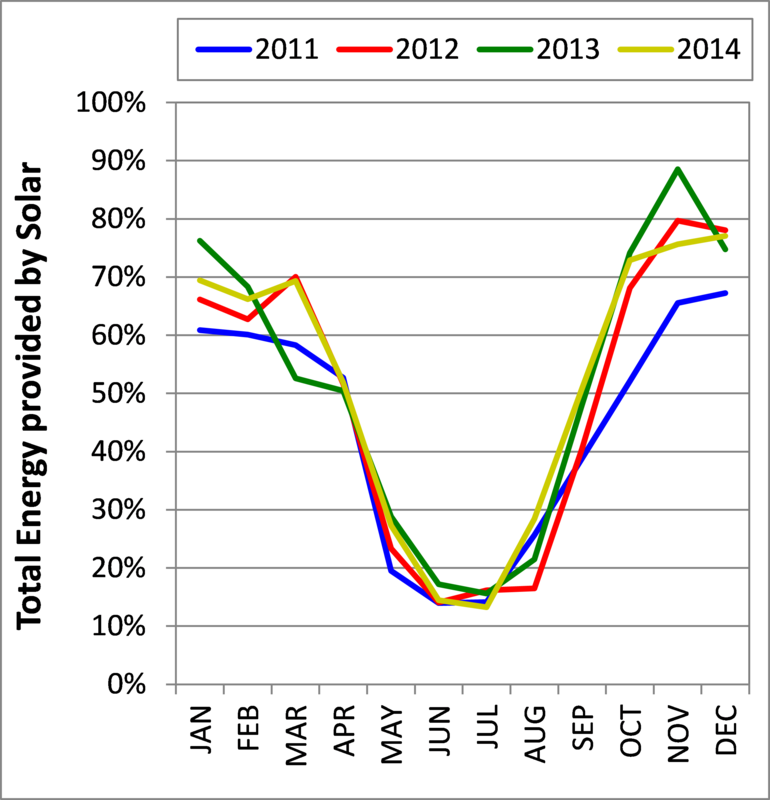 Operating under the Adelaide climate, the study has shown that on average, the domestic solar electrical energy generated ranges from 2.4kWh/kWp in June to 5.5kWh/kWp in January with an annual average of around 4.0kWh/kWp. While only one house consistently produced excess energy and negative emissions, 50% of the monitored dwellings produced more electricity than they consumed and 40% of them produced negative net emissions during the period October to April due to the high output of the photovoltaic systems during that period. The significant feature of air conditioning system usage is the relatively low hours when air conditioning was needed in comparison with similar Adelaide homes with the worst of the houses investigated needing a maximum of 3kW of electrical power with some systems needing below 1kW. 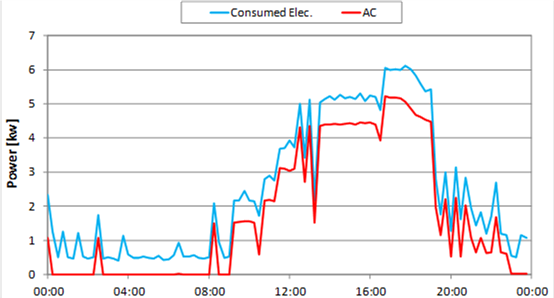 This demand is well below typical air conditioning systems previously monitored. The impact on the local and state peak demand during hot spells and cost of associated with transmission/distribution infrastructure is significant. The data analysis provides real world evidence to support the development of energy regulatory framework and future energy policy directions in the housing and appliance sectors. The monitoring of current and new dwellings, including a number of smaller units will continue for the next three years and beyond. The lessons learnt from this project, while significant along the path towards zero energy housing, demonstrate the need for better design integration to ensure the achievement of low energy dwellings which are also affordable, comfortable and aesthetically acceptable. The project also highlights the need to pay particular attention to minimising the peak demand alongside energy and emissions reduction in order to reduce the reliance on the electrical grid. A potential avenue for designing a no peak demand home is the integration of electrical and/or thermal storage systems. Through analysing the detailed monitoring data of 27 solar hot water systems in the Lochiel Park Green Village, it was possible to investigate the details and evaluate actual performance and compare with the results of TRNSYS modelling. The study highlights a number of common installation and usage issues which contribute to the systems performing well below those estimated through the TRNSYS modelling as per the associated standard AS/NZS 4234:2008/Amdt 1:2011. One of the major causes of lower performance is the lack of information to households and installers which is often due to competing health, safety and performance demands associated with hot water systems. This has, in some instances, resulted in using more auxiliary energy than necessary through incorrect thermostat and boosting period settings. 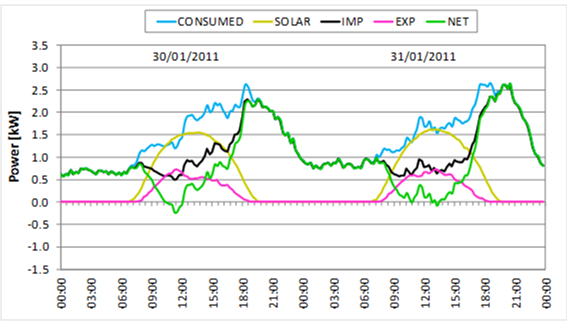 The results of the study demonstrate the soundness of the TRNSYS evaluation methodology and assumptions, the one major outcome of the study is the potential impact of the solar hot water load profile. The results showed a dependence of the quantity of hot water use on the number of residents in the house. 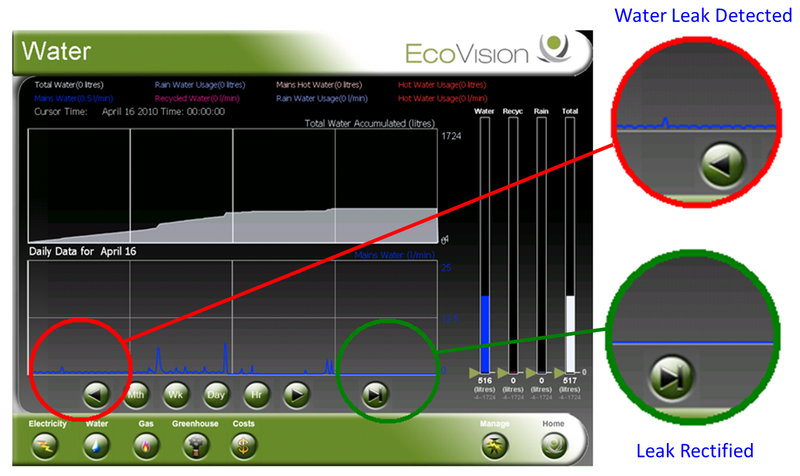 However, most systems monitored consumed a hot water load profile close to that of a small reference load. This has been shown to have a direct impact on the STC values awarded. The study indicates the need to reconsider the basis for assigning appropriate annual energy consumption associated with reference hot water systems as detailed the Australian standard. Saman W., Babovic V., Whaley D., Liu M., Mudge L. (2011) ‘Assessment of electricity displacement due to installation parameters of solar water heaters’, University of South Australia, Adelaide. Building energy policy in many countries is firmly pointed towards a need for net zero energy homes. But given the limited range of operational energy impacts that can be directly influenced by building regulations, and the wide variation in energy use behaviours of building users, what system performance levels will be required to ensure new homes achieve that standard? 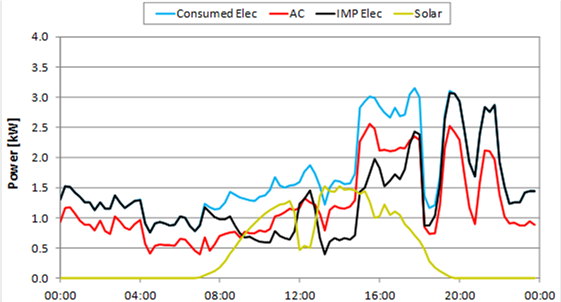 This paper utilises in-home energy monitoring from a near net zero energy estate at Lochiel Park in South Australia to provide the evidence of the system performance needed for all major end-uses, for homes in warm temperate climates to achieve, on average, a net zero operational energy standard. The evidence presented points to the combination of passive solar design strategies, energy efficient appliances, and active solar systems that will lead to net zero energy performance given contemporary lifestyles and the impact of the digital age. For the Building Code of Australia: increasing the thermal comfort standard from 6 NatHERS Stars to 7.5 NatHERS Stars; increasing the fixed lighting energy standard from a maximum 5 W/m2 to 3 W/m2; increasing the water heater standard from a minimum of 26 STCs to 40 STCs; and adding a minimum electricity generation (photovoltaic system) requirement equivalent to 2.75kWp plus 1.0kWp per each 100m2 of habitable floor area, will enable new homes to achieve, on average, an annual net zero delivered energy balance. Given the well documented health and wellbeing relationship with building thermal performance and indoor air quality, what are the implications of this policy approach? Combining interviews from 25 households and monitored energy data from over 50 near zero energy homes at Lochiel Park, this paper examines the validity of this policy goal from a health and wellbeing perspective. The evidence shows households receive high levels of thermal comfort, enjoy lower energy bills, and believe their behaviour has been positively influenced by the building and its energy systems. Yet many remain concerned that the building industry is unable to produce homes that maintain the level of thermal comfort required to facilitate good sleeping conditions during summer. Whilst the near zero energy home policy appears valid from a health and wellbeing perspective, the case study highlights the substantial task ahead for researchers to quantify the impacts, identify opportunities to improve the health and wellbeing outcomes for end-users, and support the policy transition to zero energy homes. The creation of new suburbs in our burgeoning cities does not typically lead to the creation of vibrant and supportive communities. Whilst the literature points to many health, social welfare and other reasons for establishing a engaged community, typically urban developers build clusters of homes linked more by roadways than a by a sense of community. Using a case study from the Lochiel Park residential estate in Adelaide, South Australia, this paper explores how a deliberate policy goal has manifested in the creation of a vibrant and supportive community. Extensive interviews from 25 households in the case study estate, allow us understand how residents engage with formal and informal community activities, and how they perceive the value of the sense of community.